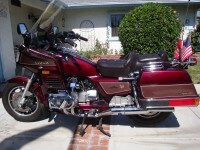 Just purchased my first Goldwing at 58 . Took a month i reckon to come to terms with the size and weight . Im about 100kgs and reasonably fit for an ol fart. Love the weight and size ,bit more chaĺlenging 2 up . Hope to be able to ride it till i kick the bucket in 30 or so yrs . First Wing a '77 GL1000 in '02 at age 44 (is that too young?) 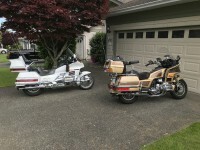 and now in the stable an '80 GL1100 (since age 47) and a '93 Aspencade with only 44K mi two yrs ago. At least I was well over 50 for that one. Posted here a couple of years ago. Time for an update. I am 73 now. I moved to East Central Florida from Northern CA last spring.. Nice to be warm in the winter and to be able to ride all winter long.. I am on my 3rd GW and road it 400 miles last week.. Last November I bought a 2007 ST1300 that I use for short rides and around town. Longer rides are reserved for my 2003 GL1800 for the most part. The ST needs the seat rebuilt since I have the Stock seat and after 150 miles I am ready to get off, not so with the GW. Now a 1985 LTD to which I'm upgrading the Alternator and adding training wheels. The best one is undoubtedly the LTD. The other bikes just felt wrong for my size. I love my TWO Goldwings! 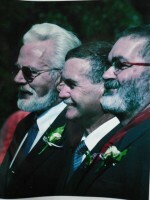 I was born in 1950 and I'm 29. And I will back you up on that - for an appropriate amount of beer of course ! Well Hello ! This is my first time leaving a message but I seemed like I had a lot in common with the gentleman That bought his first GoldWing when he was 58. 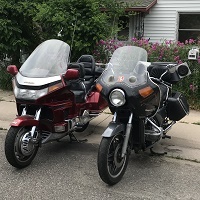 I did the same thing, and it looks like the same bike 1993 GL-1500 Aspencade 67,000 miles Black, Not bragging but maybe a little I hardly paid anything for it and my son-in-law drove it 75 miles home for me. 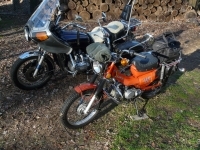 I had a 1980 Honda 750 super sport. and I got a lot of tickets on it after having it for only a year. I was younger back then, and in better shape. Ever heard of tank slapping well I didn't either until that faithful night I decided I was going to run from getting stopped by the police. I hit a bridge doing 110 and it was uneven enough to cause a tank slapping event that I had to slow down to 60 miles an hour to get it to stop, then I was off again but not for long another 3 or 4 miles. 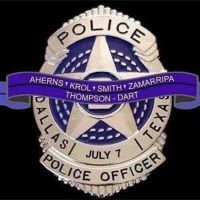 I stopped they pulled there guns, it was eye opening the things that they will throw at you in a case like this. So I started out slow on this monster, wife says she'll ride with me maybe! Well I am older, but no longer a gentleman! At 77 they have taken my heavy vehicle license off me, - over 75 is a no no here for a heavy licence. I also have no licence at present, as the traffic authority cancelled my licences, and i have to undertake a practical driving test, but I am not letting bureaucracy get me down. My 1997 Aspencade, red in colour, has had to sit for a while,but I will get back to it. I read most of the comments and found it informative. My 2004 1800ABS is lovely and enjoy my rides. Yes the beast is heavy and it does worry me slightly as I have had one mishap in the garage, my fault entirely, wrong side of bike moving back slowly to get to front valve and side stand touched something and was moved and on leaning over side stand was up and when then the weight took me with it, scary heavy and a learning curve for me, even though it rested on something it wasnt too hard too pull it back (and then panic does make you stronger), and damage was just a small nick but could have much worse for the purple paint. So methinks all in all respect the wing and it will treat you right and this site always gives me confidence in riding the wing. Oh by the way I'm 63. Update now 67 and same bike. I'm just curious to know why do I see older men on Goldwings? I GUESS THE SIMPLE ANSWER IS " BECAUSE WE CAN" AND AS LONG AS I CAN AT 74 I WILL. THANKS FOR THE QUESTION. PS; I should have answered this on my last post. I just thought to let you all know I'm still ridding @ 78 but now on a F6B, lot lighter and I don't do long trips anymore so don't need trunk and the F6B is super easy on the back side just like it's big brother. Ride safe and be happy. I even have the t-shirt. Since letting my hair get longer, the last time I wore it my daughter said I was starting to look like him. I dunno, at age 61 (and 5'5", 140#) after nearly 40 years of riding Gold Wings, I can't imagine not doing it. You learn to balance well, plan your stops carefully, look ahead, don't do quick maneuvers at slow speeds, and how to carefully pick it up when it tips over (NOT just muscling it back to upright). It's a comfortable, powerful motorcycle with lots of storage for travel -- as it was designed to be. Have I had my difficulties? You bet. And there is usually someone around to help you pick up the bike (if needed) or help in other capacities. My experience has been really good (and I've probably forgotten the bad experiences).